Description: Add beauty, style, convenience and warmth to your room. The Eco-Choice CAB50 cabinet-style, large pellet stove reduces your heating bill and lets you "live green" by utilizing renewable wood pellet fuel. 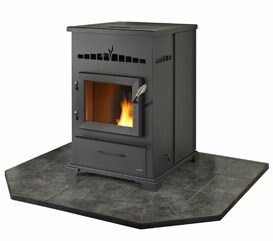 Featuring a 120-pound hopper and ash-pan with an easy-clean fire-pot, this stove delivers impressive heat with ease.